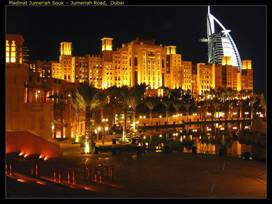 DUBAI 2005 - Another �new� site on the 2005 men�s SWATCH-FIVB World Tour, Dubai hosts the first �open� international event in the Middle East. The event ends on a Friday at the end of the week in the country. From the timeless tranquility of the desert to the lively bustle of the souk, Dubai offers a kaleidoscope of attractions for visitors. The emirate embraces a wide variety of scenery in a very small area from rugged mountains and awe-inspiring sand dunes to sandy beaches and lush green parks, from dusty villages to luxurious residential districts and from ancient houses with wind towers to ultra-modern shopping malls. The emirate is both a dynamic international business centre and a laid-back tourist escape; a city where the sophistication of the 21st century walks hand in hand with the simplicity of a bygone era. But these contrasts give Dubai its unique flavor and personality; a cosmopolitan society with an international lifestyle, yet with a culture deeply rooted in the Islamic traditions of Arabia. Since earliest times, Dubai has been a meeting place, bringing together the Bedouins of the desert interior with the pearl-divers, the merchants of the city with the sea-going fisherman. Having expanded along both banks of the Creek, Dubai�s central business district is divided into two parts - Deira on the northern side and Bur Dubai to the south - connected by a tunnel and two bridges. Each has its share of fine mosques and busy souks, public buildings, shopping malls, hotels, office towers, banks, hospitals, schools, apartments and villas. Outside this core, the city extends to the neighboring emirate of Sharjah to the north, while extending south and west in a long ribbon of development alongside the Gulf, through the districts of Satwa, Jumeirah and Umm Suqeim. At first glance, the city presents a predominantly modern face, an ever-changing skyline of new developments, from striking glass and concrete towers to gracious modern buildings incorporating traditional Arabian architectural motifs and features. Although a relative newcomer on the international tourism map, Dubai is increasingly recognized internationally as an attractive destination for travelers seeking somewhere new and different, yet offering facilities of the highest international standards. It combines the comfort and convenience of the Western world with the unique charm and adventure of the Middle East, an exotic city with a cosmopolitan lifestyle. Dubai has a perfect winter climate, top quality hotels and excellent facilities for a variety of sports and leisure activities. It combines all these with superb shopping. And, an important - but often overlooked - attribute of a destination, Dubai is friendly, safe and virtually crime-free. Dubai is also easily accessible. There are now over 100 airlines linking Dubai International Airport to over 140 destinations worldwide, making it one of the world's great intercontinental transit points. In Dubai, shopping is something special. As an open port with low import duties, prices are reasonable and the variety of products available matches that of any other major international city. Dubai offers everything from the latest electronics and brand label fashion items to traditional Arabic handicrafts, gifts and rugs as well as a vast array of gold jewelery at unbeatable prices. 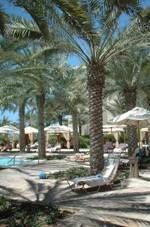 Dubai�s climate is a major asset, with sunshine virtually guaranteed the whole year round. From September to May the weather is particularly pleasant for outdoor activities. Temperatures during this period rarely rise above 26˚C (80˚F) and humidity stays low. In short, Dubai offers something to please most tastes. The Lausanne-based International Federation of Volleyball (FIVB) announced that Dubai (United Arab Emirates) has been chosen as the location for staging the final leg of the Swatch FIVB World Tour, from November 14 to 18, 2005. Announcing this key development from the FIVB headquarters, Mr. Jean-Pierre Seppey, the FIVB General Manager remarked, "This is the first time ever that the United Arab Emirates will play host to a world ranking Men's Beach Volleyball tournament and we are confident that the competition in Dubai will be a big draw in attracting top teams from around the world." Mr. Seppey added: "Dubai ranked tops on our list because of its world class infrastructure that has enabled this dynamic city to attract the best international sporting events including the European PGA ranked Desert Classic Golf Tournament, UIM Class One Powerboat Championships, ATP and WTA ranked Dubai Tennis Open, Dubai Sevens Rugby Tournament and the Dubai World Cup among others." The Dubai tournament has the potential to be a key event on the beach volleyball circuit as the Swatch FIVB World Tour is the final leg on the tour and world-ranking points are awarded to determine the winning team for the year. UAE-based Abjad Sports & Events will be organising and managing the Dubai tournament on behalf of the FIVB and in collaboration with the UAE Volley Ball Association. "We are delighted to be partnering with the FIVB and the UAE authorities in the staging of the Dubai tournament and are confident that this year's event will be a major milestone in the history of Beach Volleyball not just in the emirate but in the entire Arab world," said Abjad's Managing Director, Jean-Paul Boutibou. Dubai is fast acquiring a global reputation for combining adventure, fun and sports with sand and year-round sunshine to offer a very cosmopolitan atmosphere for organisers of sports events. The emirate's first-class sporting facilities and climactic conditions make it an ideal sports destination. The FIVB, with its 218 affiliated national federations, is the largest international sporting federation in the world. Over the last decade in particular, volleyball has witnessed unprecedented growth. The success of the Olympic Games, World Championships, the US$15 million World League, Grand Prix, World Cup, Grand Champions Cup and the level of participation at all levels internationally continues to grow exponentially. The Beach Volleyball phenomenon that is hugely visible is also gaining overwhelming popularity as a spectator sport. 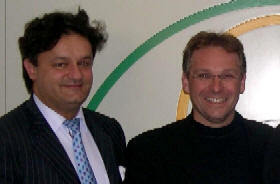 Pic: Jean-Pierre Seppey, the FIVB General Manager (left), and Abjad's Managing Director, Jean-Paul Boutibou.